A bewitching comic fantasy by a master of the supernatural Cat doesn't mind living in the shadow of his sister, Gwendolen, the most promising young witch ever seen on Coven Street. But trouble starts brewing the moment the two orphans are summoned to live in Chrestomanci Castle. Frustrated that the witches of the castle refuse to acknowledge her talents, Gwendolen conjures up a scheme that could throw whole worlds out of whack. On Saturday, March 26, 2011, the fantasy and young adult world lost a fantastic writer. Diana Wynne Jones had been battling lung cancer for a while now and the cancer finally won. I always knew of Diana Wynne Jones, but it wasn't until a Fantasy/Science-fiction course that I took in university that I actually read her. One of our assigned books was Fire & Hemlock and I loved it! It remains to this day one of my favourite books of all time. I always intended to read more from her, but I was not a big young adult reader at that time. It was actually when I read the Gemma Doyle series by Libba Bray that I slowly started to accept that there was maybe a reason I should start. In 2009, I returned to Diana Wynne Jones by finally reading Howl's Moving Castle and then one of the sequels, House of Many Ways. I loved both of them and fully intended to get back around to reading more from her. Since then I have had books aplenty to read, but have only actually managed to read Black Maria. For the Once Upon a Time Challenge this year, I wanted to make sure to read at least one book by Diana Wynne Jones. Then, she passed away and it become more of a tribute to her that I was finally going to accomplish reading a bunch of her back list and posting about them. On the one hand, I am sad it takes me so long to read books by her, but on the other hand I am glad I still have so many books by her to look forward to in the future. Charmed Life is my first foray back into her magical worlds. Now, after that rather long intro, I should maybe talk about the book itself. It is the first book in a longer series, so that means that I have of course started another series. The main character is a little boy called Cat. His real name is Eric, but his origins for his nickname are explained later in the book. The book centers around him and by association, his sister Gwendolen. I just noticed that on the back of the book they spell her name 'Gwendolyn', but throughout they spell it 'Gwendolen'. Anyway, Cat and Gwendolen survive a terrible boat crash, but their parents are not so lucky. After living with a woman named Mrs. Sharp for a time, they are adopted the Chrestomanci and taken to be raised with his family. They are an entertaining assortment, which you will learn if you read the book. Gwendolen is the one that puts things in motion to move, but Cat is hesitant to leave the place that he knows. He always goes along with his sister, though, and so finds himself transported to a very different world than the one that he knows. Sometimes young narrators bother me and take away from my interest in the book, but even though Cat has his moments, he didn't really bother me that much. I think Gwendolen was the more annoying character, but I also thought it would be interesting to hear her side of things. This book was basically a lot of fun. The antics that Gwendolen gets up to are entertaining. And, the progression of the story works rather well. I find I do not really want to say much more because I do not want to destroy the magic of the story for anyone else. So, I will just say that I enjoyed this book, look forward to reading the next book in the series, and recommend that you give it a read if you have not had the chance. This counts for the Once Upon a Time Challenge V.
I always vote for published order, mostly because I love Charmed Life the best and that's the one that got me into DWJ's books in the first place. But other people love Lives of Christopher Chant best, and since that's the one that starts the internal chronological order they recommend reading the series that way. I am not the boss of your life, but I recommend reading The Lives of Christopher Chant next, and then Conrad's Fate, and then you can read the other ones just as you please. That is my opinion. Witch Week is really good, so maybe save it for last? Here's what I posted in my blog a couple of years back before I read The Pinhoe Egg: The Lives of Christopher Chant. Conrad's Fate. Charmed Life. Then either The Magicians of Caprona or Witch Week. Then go to Mixed Magics which is composed of short stories in relation to the previously released Chrestomanci titles. I read them according to the year of release. I enjoyed it just the same. I think it's fun to read it chronologically. Which I should do. The Pinhoe Egg is a Cat story so it should be read after Charmed Life (at least to get a background on Cat). As for JK Rowling, I think one of the sites for DWJ had her quoting something to the effect that Rowling must've read her when the HP author was younger. Have fun reading DWJ! Let's all look forward to her yet to be published book! Let's celebrate the life she wonderfully lived by sharing her stories! Yay! I haven't yet read Fire and Hemlock but have been meaning to for ages and ages... (same goes for Black Maria). Reading a Diana Wynne Jones Book kind of feels like you're going home, to some place familiar but exciting and wonderful. It doesn't really matter what order you read the books in as, as others have said, they're all self-contained stories. Some have small references to the others, sure, but there's no place a lack of knowledge would negatively affect the story. I'm glad you enjoyed it, though! 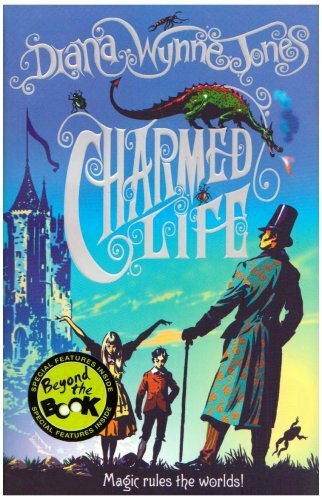 "Charmed Life" was my first Chrestomanci book too. I'm glad you enjoyed this one too! And I'd also advocate reading The Lives of Christopher Chant next. I started this one this week as well, really enjoying it so far! This was my first Chrestomanci book too (just last year! ), then followed by The Lives of Christopher Chant (I read the same ommibus as Eva!). The order threw me slightly, but I think it worked - and I liked reading in the published order. *Lightheaded: Good to know. Thanks! *Darren: Glad you are enjoying it so far! *Li: I think I will just go with Lives of Christopher Chant next, too. I have Howl's Moving Castle checked out from the library. While I've never read this author, I've heard really good things and am looking forward to reading this book. Great review!